The Saint Berdoodle is bred by the crossing of two popular dog breeds the Saint Bernard and Standard Poodle, such dog breeds are known as designer dogs and are very famous with dog lovers. Cross bred dog breeds have qualities from both the breeds of dogs used to create them, usually through selective breeding the flaws of the breeds are weeded out and the good qualities are retained. This breed of dogs is powerful alert and brave. 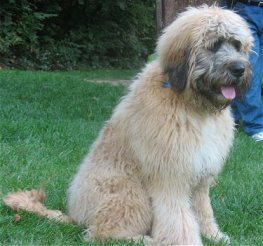 The Saint Berdoodle dog breed have dark eye and are very intelligent, the are loyal to their masters and have a good nature, they are a very good watchdog but are not recommended for homes with small children.This dog breed needs early socialization and do good with other dogs if they are raised with them. They are very demanding and do not do good if they are left alone or are ignored. They are very protective and are suspicious of strangers and are very good if they are assigned to guard or as a watchdog. This breed of dogs has a single coat and typically possess a curly coat which can be either smooth or rough. Because of their aggressive nature they need a dominant owner who can lead them. Saint Berdoodle are not good for first time owners because of their demanding nature. Training must be given with love and patience, Saint Berdoodle will not respond to any rough and harsh methods of dog training. They may be prone to such health issues as Wobbler Syndrome, hip dysplasia, PRA, ear infections, Von Willebrand's Disease, skin problems, and bloat. This breed of dogs has an average lifespan of about 12 years. Like other dog breeds the above stated diseases are common in this breed of dogs and as a dog owner it is your responsibility to assure that your pet is healthy and provided a comfortable environment. If you notice any dog disease symptoms be sure to check with a veterinary so health problems can be diagnosed at the earliest and treatment can be provided to your pet in a timely manner.